The Philippines can be considered rich when it comes to ecosystem variety. After all, it has forests and seas teeming with life. However, the country is rather lacking when it comes to large beasts like the bears of North America, the elephants of Africa, or the tigers in other Southeast Asian nations. However, science tells us that this was not the case in the past. If you are to go back thousands or even millions of years back, the Philippines was actually home to creatures like gigantic elephant-like mammals, ancient manatees and rhinoceroses. Fossils dug up from various sites in the country provide us a picture of what types of animals roamed the archipelago in the distant past. Below are five of such animals. 1) Stegodon - At first glance, they look like woolly mammoths without the wool. Or modern elephants without the gigantic tusks. However, science tells us that they are neither because stegodons went extinct thousands of years ago. The last of them are believed to have died out near the end of the Pleistocene era. Early scientists had the theory that stegodons may have been the ancestors of modern elephants. However, evidence that have been gathered through the years disprove this theory. Thus the current consensus that stegodons have no modern descendants. Stegodons used to roam in large parts of Asia and East and Central Africa. The beasts can grow up to 15 feet high and 30 feet long. Fossils of them have been found in Asian countries like China, Indonesia, Thailand, Taiwan, Japan, and of course the Philippines. A molar of the animal was found in the province of Kalinga in 1973. Fossils of the stegodon were also found in Mindanao. Below is a life-sized model of a stegodon. Note that it looks like a cross between a woolly mammoth and a modern elephant. 2) Philippine Rhinoceros - It's interesting to think that these horned animals used to roam in the forests of the Philippines. Sadly, they haven't been around for thousands of years and all we have to prove that they once lived within our shores is a single fossil dug out from Pleistocene sediments in Fort Bonifacio in 1965. The fossil was that of a portion of the animal's right upper jaw with two intact molars and a broken one. Very little is known about the Philippine Rhinoceros because a full skeleton of it is yet to be found. Aside from the fossilized jaw bone and the estimate that it went extinct during the Pleistocene era, there's no other information available about it. But if you want to get an idea of what it would've looked like back then, below is a photo of a living Sumatran rhino. 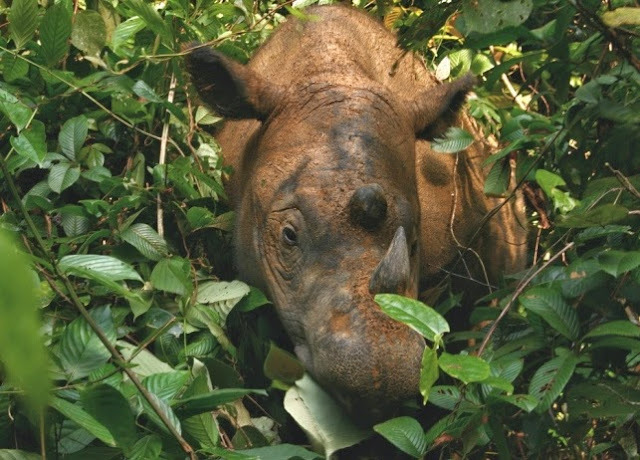 Sumatran rhinos are cousins of the Philippine rhino. The latter are believed to be larger than their Sumatran counterparts. 3) Cebu Warty Pig - This particular pig has the distinction of having been declared extinct in modern times. It was assessed as extinct in 2000 which is less than two decades ago. The culprit? Humans of course. Cebu warty pigs went kaput because of two main reasons. One, they were hunted down for food. And two, their habitat were destroyed. The Cebu warty pig is a subspecies of the Visayan warty pig which in itself is also critically endangered. A very small number of them remains in the wild. Some of them are being kept in captivity which in a way stirs up hope that it will be much harder for them to go extinct. 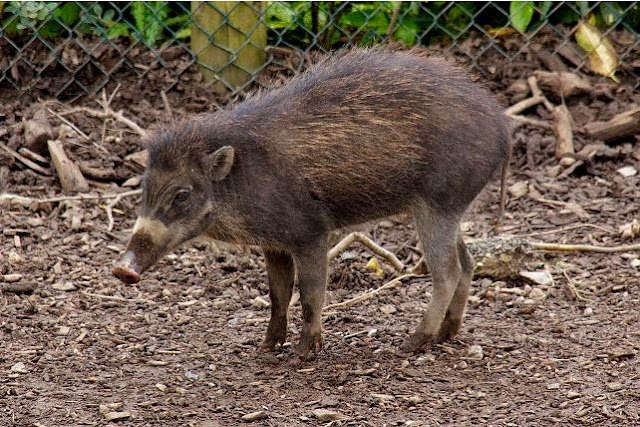 Below is a photo of the Visayan warty pig. It's very closely related to the now extinct Cebu warty pig so they pretty much looks the same. Look at it closely because who knows, it might be gone in the next decade or so. Hopefully, it wont. A Visayan warty pig. Source: Mike Peel via Wikipedia Commons. 4) Sirenia Sea Cow - In 2011, a team of scientists from the University of Florence in Italy found the fossilized remains of a sea cow inside the Puerto Princesa Underground River in Palawan. Fossilized ribs and sections of a spine were found embedded in a rock wall. Leonardo Piccini, an Italian geologist who was part of the expedition said that the fossil dates back to the Miocene era which is about 20 million years ago. Study of the fossilized bones showed that they belonged to an extinct species of plant-eating sirenia or sea cows. There are two species of sea cows that are in existence today. These are the dugongs and the manatees. The fossil found in the underground river in Palawan is the first of its kind ever found in the Philippines. Other similar fossils were found in Java, Sri Lanka, and Pakistan. 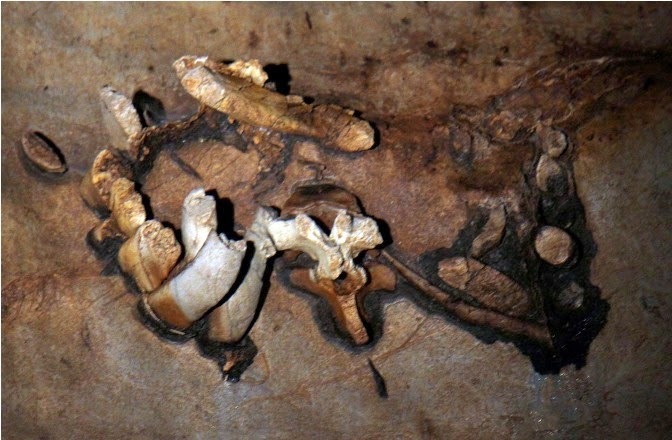 A photo of the fossils found embedded in the walls of an underground river in Palawan. Source: KJ Rosales via The Archaeology News Network. 5) Dwarf Buffalo - Some people are often humored when they see the rather small size of the tamaraw water buffalo which can be found in Mindoro. Well, these people haven't seen nothing yet. 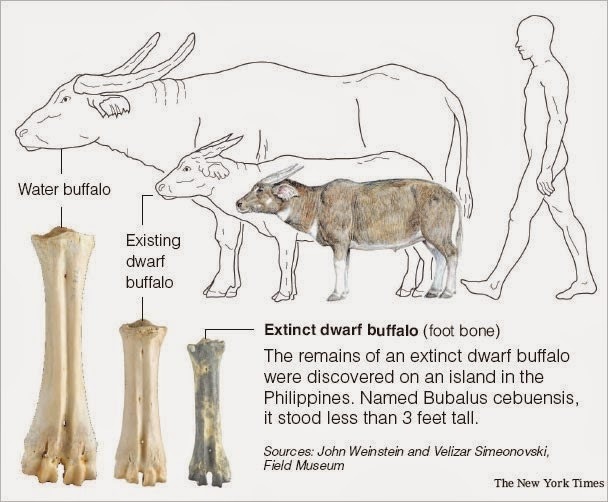 A set of fossils found in Cebu implies that an even smaller species of water buffaloes used to roam in the archipelago. This extinct species now referred to as either dwarf buffalo or pygmy water buffalo lived between 10,000 and 100,000 years ago. They are quite small in nature. A mature one stands only 2.5 feet and weighs only 350 pounds. That's a pittance if you compare it to the average size and weight of water buffaloes today. To give you an idea of how small the pygmy water buffalo was, below is an illustration comparing it to the modern water buffalo and an average-sized human being. Neat, isn't it? The animal looks more like a dog than a carabao. Source: Discovering Archaeology via Wikimedia Commons. We're pretty sure that there are other extinct animals out there that used to roam in the Philippines. There are fossils out there that are yet to be found by archaeologists and paleontologists. We are looking forward to the days when these fossils are discovered and announced to the public. Until then, let us think in wonder to the fact that we are trudging on grounds that used to catch the footsteps of extinct elephants, rhinoceroses, and mini-carabaos.